This blog contains the CD, DVD and other music reviews from the Crossroads Blues Society of Northern Illinois. Northern Blues has been cranking lately! Check out their website. With a focus on the blues, it’s natural that Crossroads ends up in their sights. I don’t assume that every CD coming for the likes of Northern Blues, or even Alligator for that matter, has to be pure blues. But I’m not sure what to make of this CD from Eddie Turner. 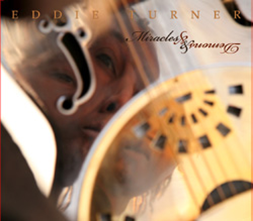 The packaging I very slick, showing Turner reflected in a chrome metal-bodied guitar. Inside is a foldout of Turner shot successively moving into a squat. So what you say. Well the CD’s packing is emblematic of how I read the disc: slick, overproduced, and enigmatic. After four listens, I still don’t have a sense of who Eddie Turner is or who he is writing to or for. Having been a one time guitarist for Colorado’s Zephyr and then Otis Taylor gives some clue. This CD is layered THICK with metal bodied guitar and LOTS of highly processed electric guitar. Part of me thinks Eddie would like to be Jimi Hendrix. I hear “Belly Button Window” and “Room Full of Mirrors” in his “In The Morning,“ and “Mr. Blues.“ Literally, every song is wrapped in a thick layer of guitars, keys, and percussion. Turner tends to speak and even whisper his lyrics. Can he sing? On some fade outs it appears he is straining in his attempt to sing. He composed all the songs, but like I said, they seem to be mysteries . There are no stories to grab, no characters we’ve encountered before. The songs all seem to be about Eddie’s demons or to a female that’s never developed. Maybe Eddie doesn’t want us engaged in anything but the heavy grooves he lays down. Much like Northern Blues Samuel James, Turner seems to be writing for himself. Maybe I went to sleep and blues isn’t universal anymore. Either way, blues fans will be confused by this CD. Hendrix fans may find something here. But what Hendrix had: poetry, hooks, and I-live-on-Mars visions, Turner is sorely lacking. The guitars serve only to keep the groove alive. The only solo, in “Mr. Blues,” is so irritating that it’s temping to hit the Skip button. Turner borrows from himself at times--see the reprise of the title song at the end and how “Miss Carrie” is just “Say” (song 2) all over again. The nods to blues-like intros and outros and borrowed “hellhounds” and “wolves” and “blues falling like rain” seem to only distract us from what is a heavily electronic “dance” CD. Yet I don’t see this disc being played in clubs nor even satellite radio. Again, who is the audience? Because Turner never really says much, sings much, or plays much, it’s hard to say something positive about this CD. It definitely has a groove factor. But the groove and the production (overproduction) can’t carry the day, not make this a “blues” CD. Turner’s blues may have, indeed “fell down like rain” but we want to know why. What miracles? Where are the demons? Why a Side One and Side Two labeling on a one-sided disc that has no discernable storyline or break? I’m afraid that under the slick cover, Eddie Turner has no clothes.